In this blogpost I aim to outline how a combination of modern technologies (including the blockchain technology, BPM and cryptography) can enable good practice for carrying out business in the digital world. Such a combination enables 1) the establishment, 2) the execution and 3) the imposition of digital contracts digitally, quickly, surely and (potentially) legally. Thus a digital contract enables business can be carried out fully digitally, with less risk and fewer resources. impose agreed liabilities on some business parties. has negligible cost and overhead. One of these technologies is the blockchain technology which enables the creation of immutable, tamper-proof and transparent records https://www.linkedin.com/pulse/summer-reading-viewing-update-blockchain-arno-laeven ). Despite the existing hype around it ( see https://theconversation.com/blockchain-really-only-does-one-thing-well-62668 and https://medium.com/@pavelkravchenko/decline-of-blockchain-hype-and-rise-of-a-common-sense-8de5789a794d#.olmj0go1e ), the blockchain technology is mandatory for doing business in the digital world but alone it is not enough. Potentially, digital contracts will further develop and properly implement promises of “smart contracts” blockchain-based applications which are rather overhyped ( see http://www.coindesk.com/smart-contract-myths-blockchain/ ). The key of doing business properly is a contract which is an agreement with specific terms between two or more business parties in which there is a commitment to do something in return for a valuable benefit known as consideration. A good contract must have several factual elements. They are listed below together with some modern technologies and methodologies which enable those elements in the digital world. In general, any promise, commitment, document, written or oral (e.g. by Skype) communication between business parties (which are involved in a contract) is secured by the blockchain technology. The last is acting as immutable, tamper-proof and transparent storage of records. terms and conditions for performance, including fulfilling commitments – can be formally expressed with various decisional business rules (also known as decision management) and behavioural business rules. an acceptance of that offer which results in a meeting of the minds – various cryptographic technologies and document management help to enforce integrity of documents, identity and authorization of business parties and confidentiality of all documents and communications. agreed performance indicators – how well all the business parties are fulfilling their commitments. The table below shows primary (P) and secondary (S) relationships between contract concepts (rows) and process concepts (columns). 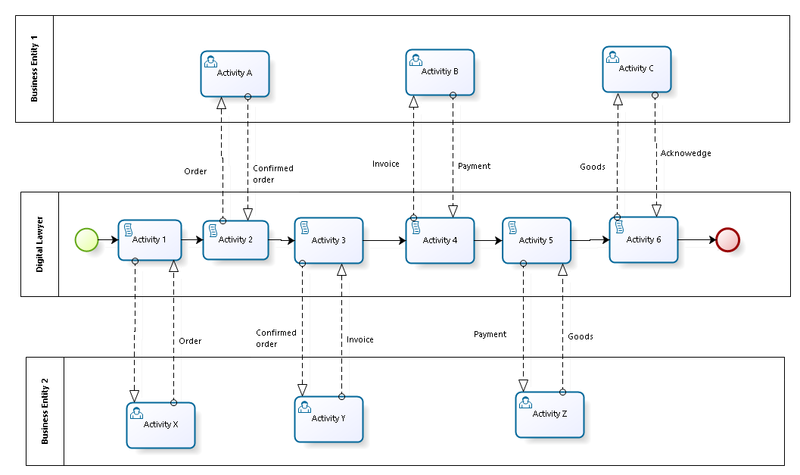 It seems that a contract can be expressed as an explicit business process with a level of formalism which is understandable by all the business parties (thanks to popular visual notations for coordination and business decisions). By definition, a contract is a description of expected behaviour of all the business parties. With a classic contract, each business party is accountable for its behaviour and no one has a full and objective overview. In some cases, to mitigate this risk or to speed-up the execution of a particular contract, a lawyer or a notary may be assigned to conduct the execution of activities of a particular contract. Having digital contract defined formally as an explicit process, there is no need for extra human to conduct the execution of a contract. Such a “conductor” can be a robot (i.e. a computer, actually some software tools, known as BPM-suites) – let us call it “digital” lawyer (or arbitr). Actually, not a robot or computer, but some software tools, known as BPM-suites. Thus, all the business parties may agree that a particular “digital” lawyer can be the conductor for a particular contract. Another option is that each business entity assign their own “digital” lawyer and those “digital” lawyers have to reach agreements about everything that happened with a particular contract. In addition to “digital” lawyer, a “digital” notary may be required to record everything that happened (i.e. audit trails) in a private storage ( see privacy concerns at http://www.americanbanker.com/news/bank-technology/banks-privacy-concerns-shaping-blockchain-vendors-strategies-1090411-1.html ) and deposit related digital signatures (or hashes) into a public storage implemented with the blockchain technology. Also, a “digital” lawyer may act as a “digital” escrow if accepted by all the business entities. It must be clear that any complex contract (therefore any contract as a process) does not cover all the exceptional situations which are usually addressed by a court. An interesting “by-product” of contract-as-an-explicit-and-computer-executable process is the ability to simulate (or imitate) the execution of a digital contract under the various scenarios (e.g. WHAT-IF scenarios). Thus the business entities can be fully informed about any potentials traps in a contract they are supposed to approve. From the BPM point of view, digital contracts coordinates two or more cross-business-entities co-processes. Without a digital contract those processes (see the left part of the illustration below) have to coordinate the joint work by themselves. While adding a digital contract (see the right part of the illustration below) makes the coordination explicit and easier to implement (that is important for small contracts). one discretionary phase: exception handling. contract-specific information (including the identity of contractors). Obviously, some of those parts can be approved once and re-used many times. Additionally, the whole contract and some of its parts may be simulated with some scenarios to estimate associated traps, risks, benefits and losses. Contract execution is a formal enacting of a particular digital contract-as-a-process by some software. This software acts as a “digital” lawyer and it is responsible for coordinating activities which are assigned to related business entities. For example, a buyer must pay to a vendor an agreed amount of money and then this vendor must deliver some goods to this buyer. Some activities may be assigned to the “digital” lawyer as well. Also, the “digital” lawyer may act as a “digital” notary to keep the records of everything that happened with a particular contract. Contract closure is an additional activity to ensure that all the business entities agree with the execution of a particular contract. Contract monitoring is a permanent activity for controlling that a particular contract is executing correctly. Contract exception handling is a set of activities to be initiated if something went wrong with a particular contract. Such situations may involve a “digital” judge. In this example, a buyer wants to purchase some digital assets (a personal copy of a digital book or a car renting certificate) from a vendor. Both of them can use only digital money. Because the buyer and the vendor don’t trust each other, they engage an independent “digital” lawyer to conduct this purchase via a digital contract. This “digital” lawyer explicitly acts as an escrow and a notary as well. The desired sequence (also known as happy path) of activities is the following. The same sequence with more details. They engage a certified “digital” lawyer via a standard digital contract (which is digitally signed by some legal authority). The standard digital contract and identities of three business entities forms an engagement contract. This engagement contract is digitally signed by three business entities (with their private keys). A digital hash of the signed engagement contract is saved as a record (the lawyer acts as a notary). The contract is digitally signed by the vendor (with his/her private key). A digital hash of the signed contract is saved as a record. The contract is validated by the “digital” lawyer. The validation report is digitally signed by the “digital” lawyer (with its private key). The contract signed by the “digital” lawyer (with its private key). Digital hashes of the signed contract and validation results are saved as records. The validation results are analysed. The contract is digitally signed by the buyer (with his/her private key). The contract (which is already signed by buyer and vendor) is signed by the “digital” lawyer. The agreed amount of digital money is transferred by the buyer to the “digital” lawyer. This transaction is saved as a record. The “digital” lawyer (acting as a “digital” escrow) validates that the right amount of money has been transferred. The vendor change the ownership of the digital assets to be sold in accordance with the contract. The buyer confirms the reception of the digital goods. The “digital” lawyer (acting as a “digital” escrow) transfers the digital money to the vendor. The history of the contract is prepared and shared with the buyer and the vendor. This history is saved as a record. Again, this is only a happy path without any problematic situations. Important that all the procedural formalities can be implemented exactly in accordance with the legislation of a particular country. Because of the detailed audit-trail which is saved as records, any disputes about a particular contract may be resolved by a “digital” judge. Both characteristic, “explicit” and “computer-executable” of digital contracts are equally important. For example, smart-contracts are computer-executable but they not explicit because they are pieces of code which is not understandable by some business parties. 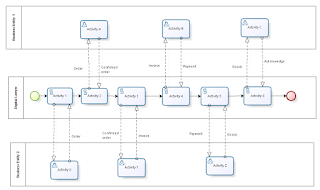 Also, some traditional laws contain typical process diagrams (see http://improving-bpm-systems.blogspot.ch/2014/07/practical-process-patterns-laap.html ) to become more explicit, but they are not computer-executable.